Should be tomorrow that the Ableton Push finally arrives. Customs delays and postal delivery delays have kept me very antsy! In the mean time upgraded the Internet pipes from 38mbps up and 1mbps down to a 150 up and 10 down. Not bad. So far I'm faster than almost 70 percent of Canada. B grade? 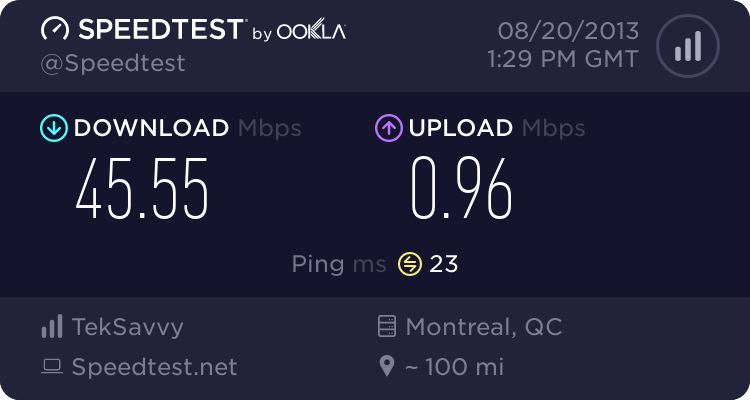 I suppose thats due to the poor upload. We'll see how a 10x multiplier might help that . . .